When I first came into Second Life, I became intrigued with it’s clothing fashion and all aspects of it. At first I didn’t know where to turn to find good clothing or how to make my avatar look human and beautiful and well coiffured. I did find a wonderful woman HoneyBear Lillihook, who took me under wing and helped me. To this day we are still best of friends. She is now the person I have known the longest in Second Life. Honey showed me how to find good clothing and shoes and helped me with designers. The first pair of boots that I saw on a woman that really stood out to me I fell in love with. I IM’d the woman and asked her if she would please tell me where she got her boots and she sent me a landmark for Bax Boots. At that moment I rushed over to the main store and bought my first pair, that has been a year now. I still love them as much as when I first ever spotted them being worn. Still in my mind, no other boot out there compares to the all over design and quality of the Bax Boot. The show was hosted by Una Ewing, the CEO of Ewing, and what a fantastic job she did, whilst of DJ Sexyjade Echegaray kept smooth tunes going throughout the presentation. The models presenting Amanda’s designs were Top EFA Model Bobie Woodget and Titled Models Aleida Rhode, Tiffany Dragonash, Ella Quinsette and ZoeAnastasia Aeon. It was a truly magnificent show and it was a pleasure to work with Amanda. The fantastic runway was set in the city of New York at midnight with urban streetlights. I swear I even heard thunder and lightening. There was rain and smoke and we saw a few umbrellas up amongst the audience, with everyone looking fabulous and fitting in with the theme. Check out the pictures by TIllie Ariantho, you may find one of yourself! RUNWAY ROBICS – This Thursday! Hello fashion foes! I am thrilled and so excited to finally announce the date of the first Runway Robics games on Thursday 26th June at the EFA Exhibition Building on the SL5B sim. Think of it like your yoga or aerobics class; a time to sweat, hang-out with friends and enjoy great moments with other beautiful people. Only this time, it is on the runway and the stakes are high! Do you dare to tread the boards, beat the challenges and risk elimination? Runway-Robics is the new concept event from Ewing Fashion Agency for models, both professional and non-professional, and anyone else who dare to take a taste of the runway. A chance to win amazing prizes while having serious fun. Your hosts, Rena Mascot and Bobie Woodget, will be planning your assault course. So, if you think you are up for the challenge, grab some of your friends and come on down to Runway-Robics on Thursday! This is an event you won’t be wanting to miss out on! LeeZu Baxter Designs is a successful design firm creating women´s clothing and accessories, owned by LeeZu Baxter, the designer herself, and Suzi Phlox. Not that long ago, they also released clothing for men. They design, manufacture and sell their own creations in-world and they are also selling them in their eight retail outlets and through SL Boutique. LBD offer three lines: low budget, ready-to-wear and designer originals. 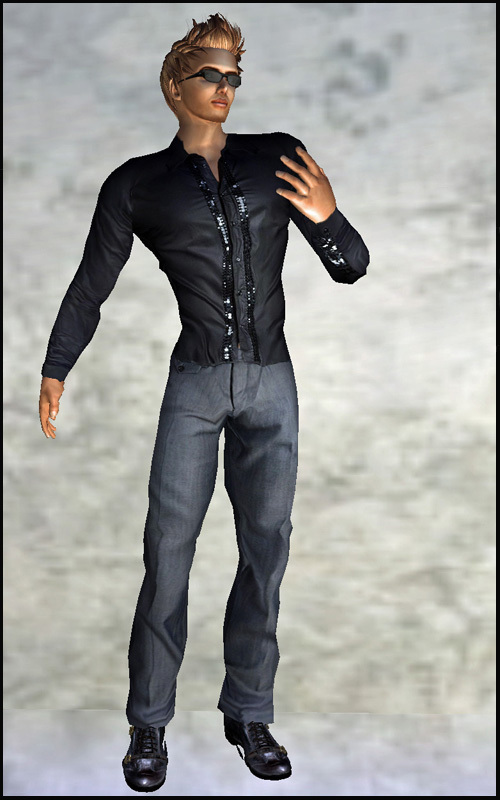 The people behind LeeZu Baxter Designs are well-known for their originality and incredible creations in Second life. Their designs are original simply because they do not copy or get ideas from the real life fashion world. When I met LeeZu Baxter for my interview, she said: “I never read any RL fashion magazine, nor do I follow the trends in real world, and it is the reason why people don’t know what I will present next time.”.In other words, they rock the SL fashion world with their unique and incredible outfits and never fail to get attention. LeeZu Baxter: First of all, I have a Linden problem – with their templates. To have only one arm that mirrors the other one is too stupid. Also, this program (SL) still has a lot of other issues about it that prevent displaying fashion or ideas in a perfect way. Aleida Rhode: What is your vision for the future as a SL fashion designer? LeeZu Baxter: Perfect ionizing this program to be more flexible in designing fashion here. It’s a great market place to test what people really would like to wear without all the regressions in RL. Aleida Rhode: How much do RL fashion trends influence your creations? LeeZu Baxter: I don’t read RL fashion magazines, neither do I know about what designer is creating what, except when I see it accidently, as I hate it to be influenced by them. That would not be creativity then. I know the basic things or the golden line in fashion since I know it as a media designer also. I don’t need outside influence. I’d like to think that my look is funky casual. I try to keep up with the trends by visiting old and new stores in Second Life. I do, as well, read various designers’ websites to keep myself up to date and know when they will be releasing new stuff. Or, I suddenly remember a place I saw a long time ago, so I decide that it is time to revisit them. Very often, I come across surprises which haven’t been mentioned in the SL fashion news. I love them, like I did when I went to Freesoul, a store I used to frequent when I was still new in SL. For example, I found these cute baggy military pants, so nice to wear and looking good too. There are many other cool stuff from Freesoul – well, if it was in RL, I would say that most of the stuff you find there are for teenagers, though, I am not that old yet, so I like to wear young styles. To me, fashion has no limits, you are the fashion yourself together with your personality. Shoes are from Periquita – available in various trendy colors – and it’s also possible to purchase a fat pack. My bag is very realistic looking. I got it from Five Minutes After Outfits. My shirt is from Punch Drunk and is part of a dress called Rockstar. As for the hair, someone told me that I need to comb it, well, that’s true, but I love the style – you can get it from Bishwear and they also have lots of other hair styles, good quality variety for every taste. The Alpha Male: New Releases At Redgrave! When I joined SL nearly a year ago, I coincidently landed on Tableau where Paper Couture have their shop and I admired the designs and creativity. Being my curious self, I researched through the designer’s profile and found out that Paper Couture consists of a group of the very talented Lu sisters. They have since then been my absolute favorite designers. By the way, Paper Couture and its designs remind me very much of the real life British designer John Galliano both ín colour and style. For today’s post, I have only picked 2 sets of their entire collection, “Divinchy” and “Rosette,” so stay tuned, because next week I will be bringing 2 other sets from my PC to you! What I see in “Divinchy”: The big hat makes you feel like a Diva whatever you’re wearing. The design and details are awesome. Prims are sculpted well, depending on your avatars body, you may adjust them a little to make them fit better. The style reminds me of “The three musketeers” from the 16th century. There is something interesting about the black bag – as soon you are wear it, a message pops up asking: “Would you like to animate your avatar?” By saying yes, the bag moves smoothly along with your movement and for photo shoots, where you have to be on a posestand or have your hud on, I recommend hitting “no”, else you will look funny with the bag while posing.